The Sringeri Sharada Preetham is a monanstery established by the ancient philosopher, Adi Shankara in the Chikkamagalur district which is 303 kilometers from Bangalore. The Acharya, Sankara installed the statue of the Mother Sharadambika on the banks of the river Tungabadra. This monastery is still the heart of the Smarta tradition. It was this place where Sankara envisioned a snake opening its hood to protect a frog from the falling rain. This is one of the four important temples established by Sankara Acharya. As legend goes, the Acharya Sankara asked for a boon from the Mother Upaya Bharathi also known as the Goddess Saraswathi that she shall be with him wherever he travels. The goddess agreed on a condition that she will be following him everywhere but he should not turn back. As if he did so she would stop at the place where he broke his promise. As he travelled across many places he could hear the sweet sound of the Devi’s anklets following him. One day he came across a place where he saw all the animals living in harmony. He thought that this was a perfect place for yogis to stay. But he sensed the sound of the Devi’s anklets stop and turned back. He decided to build a temple there and installed the goddess Sharada there. The temple functions from 6.00 am to 2.00 pm and between 5.00 pm to 9.00 pm. 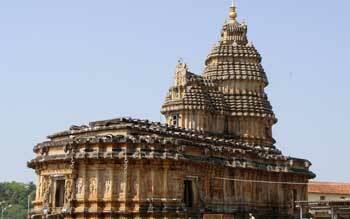 The Sankara Jayanthi festival is celebrated with much grandeur here. Apart from that Sri Krishna Jayanthi, Vyasa Puja, Vinayaka Chaturti and Varalakshmi puja are the important festivals celebrated here.